Here is a list of Best Free LIT Reader Software for Windows. These LIT viewer let you open and read LIT files stored on your computer without hassle. Open LIT files while making use of various advanced reading and annotation options. I tried to find hard for options to open LIT files on Windows, but only succeeded with two software. One of them is the default discontinued product of Microsoft, while the other one is a famous and versatile eBook reader. LIT is a proprietary format of Microsoft and opens up easily on Microsoft’s default reader, that is Microsoft Reader. It gives you awesome annotation options, along with great readability and eBook audio reader option. It has some cons but are shadowed by its annotating capability, readability, and by the fact that its one of the rare software to open LIT files. Calibre is way ahead of Microsoft Reader in this game. Its eBook managing capability and excellent eBook reader features puts it a step ahead of the default reader. Add bookmarks, navigate easily, and convert LIT to other formats with this free LIT reader. You will get to know more about these LIT reader software in the article below. Go through the article and you will get to know how to open LIT files on Windows with these software. You can also checkout the list of Best Free Ebook Reader Software, Best Free eBook Creator Software, and Best Free Software To Convert Mobi To PDF. Add Bookmark: Select a page on the eBook to bookmark it. Bookmarks can be placed at various pages. Choose colors for a bookmark from 11 different colors. Delete option is also available. Add Highlight: Select a text portion, which you feel is important to highlight, then right click to select the Highlight option. The selected text will be highlighted in yellow color. Add Text Note: Right click on the eBook to add Text Note. Here you can add any descriptive text and keep it saved on a page. After you have finished writing, text note is minimized on the page into a small note icon. You can delete it any time. Add Drawing: Add freehand drawing on an open eBook with different colors. Drawing can be made on different pages and can be undone anytime. Use the Find option to search for text throughout the LIT eBook. 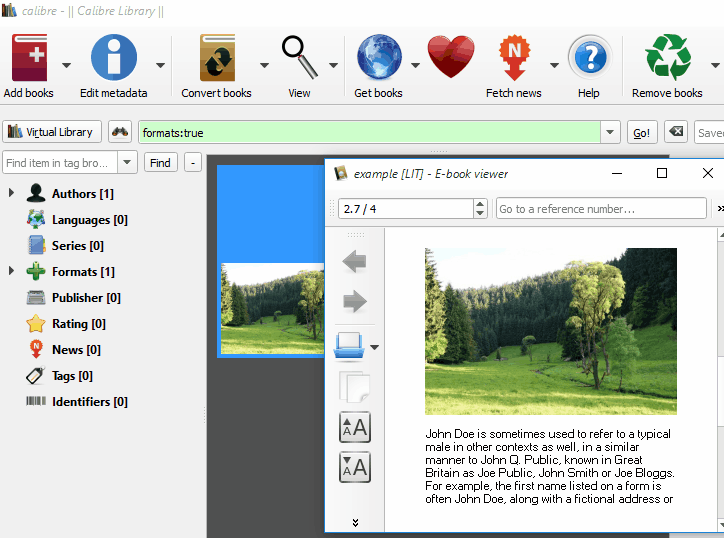 Text can also be copied from this software to read LIT files. There are certainly some negative points of this freeware LIT reader. It does not let you browse and open eBooks from computer. To open and read LIT file, you will have to drag and drop the file on its interface. The eBook is saved in this reader’s library. You can also not simply navigate from one page to another. You will have to scroll through consecutive pages to jump from one page to another. Another unsatisfying fact about this eBook reader is the number of formats it supports. You can only read LIT, PDF, TIFF, and XPS files here. Go to the Shop menu to buy eBooks online. The Settings option on the interface just lets you adjust you text side through a slider. All in all, this is a very basic LIT reader with some features worth scoring, like the eBook text reader. Calibre is an Open Source LIT reader which can easily let you open and read LIT eBooks on PC. It is a versatile and very famous eBook reader which also lets you manage your collection of eBooks. Its advanced features provide a very pleasant eBook reading experience. It supports a lot of eBook formats. Apart from Microsoft Reader, this is the only free eBook reader software which can open LIT file on Windows. Not only Windows, Calibre runs on MAC and Linux as well. You can add a LIT file to the Calibre library to read it. Click on the Add Books option on the main interface to view options to add books. When a book is loaded, click once on it to view its cover image and other details, like: author, format, path, etc. Double click on the LIT file to open it in a new eBook reader window. The reader window is simple one with various navigation options. You can either scroll mouse to change pages or use the buttons to do so. Font size can be increased or decreased as per your convenience. A Table of Content button is available for easy navigation. Toggle Full Screen or small screen as you like. Bookmark option is also available. The fonts are customizable, various keyboard shortcuts are available, and you can create and use themes, all under the Preference section. If you want to print LIT file, you can do it directly from the eBook reader window. eBooks can be printed from here as PDF. The navigation and the search options are exceptional. Edit Metadata of eBooks singularly or bulk edit eBook metadata. Convert eBooks to other formats. You can also bulk convert eBooks. Search online for eBooks and download. Download and view NEWS from various sources. Excellent options to manage eBooks based on Authors, Languages, Formats, Publishers, Rating, Tags, Identifiers, etc.